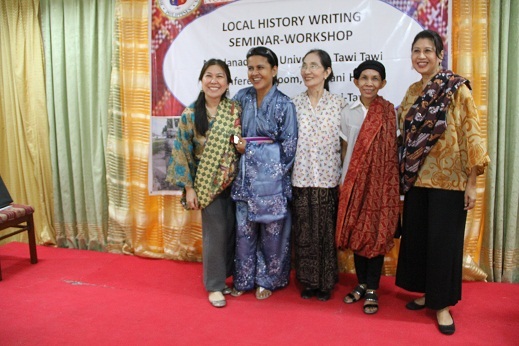 The more important occasion on the 2012 trip to Tawi-Tawi was the Local History Writing Seminar-Workshop on 28-29 September 2012 held at the Sabdani Bulante Conference Room at the Mindanao State University-Tawi-Tawi. 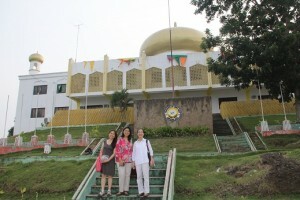 The seminar-workshop was the brainchild of Prof. Filemon Romero, PhD. Aware of the importance of reviving and promoting local history writing, various agencies supported the project: the NCCA, the MSU-TCTO, the provincial government of Tawi-Tawi, the local government of Bongao, among others. Some 100 participants from the academe, local government, government agencies (NCIP and NCMF), civil society, cultural groups, and members of the Sultanate came to contribute to the field of local history writing in Tawi-Tawi. Ligaya Amilbangsa delivered her paper: A Case Study: Method of Instruction for the Preservation and Conservation of the Pangalay Dance Tradition of the Sulu Archipelago. She began her paper with words of wisdom from a seasoned cultural conservationist: “To disregard dance tradition is to lose history. Because other than the precious movement vocabulary and music, dance is costumes, accessories, properties, and context within its place of origin. The method of instruction should be easy to comprehend, simple yet precise, consistent, comprehensive, flexible and realistic. Sensitivity is a key to learning and gaining mastery of the pangalay movement vocabulary in such a method.” Included in the demonstration are pangalay variants that reconcile tradition and transformation, thus illustrating that the distinct character of pangalay (also known as igal among the Sama and paunjalay among the Yakan) can be simultaneously preserved and conserved. Dancers who participated in the pangalay dance demonstration from left to right: Nannette Matilac, Jing Kalbit, Ligaya Amilbangsa (paper reader), Beng Mugong-Delasas and Mariel Francisco. The seminar-workshop was a big success and plans for implementing the recommendations of the workshop are underway. Photos courtesy of Cynch Paz.